First a picture of my baby! 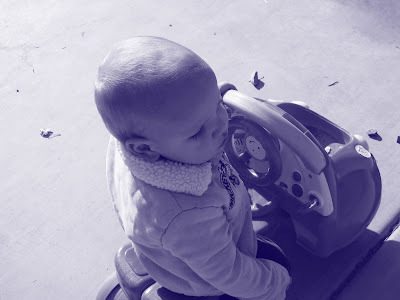 I loved this picture, and I have been playing with photoshop, so a blue picture was too fun. Here's a cute purse quilt done by Nedra of Cactus Needle, I did a lot of shadowing (echoing) in this quilt and I like how it turned out. I am still struggling with going around circles, I just can't seem to get them exactly right. But, then again I have to remember that I am not a computer and I can't get everything perfect. If I did, what would be the fun in that? Here's a close up, love it! The quilting just worked out perfectly for this quilt. Clint got me a $20 dollar gift certificate to Scrap Apple Quilts for Christmas. I was so thankful because it's been a long time since I just bought fabric for myself to make something for myself, but I did look at him and said "twenty dollars? What can I get for twenty dollars at a quilt store?" So, I spent more than that, he doesn't need to know how much and I bought these cute fabrics to make me some new quilted bags to carry around. Don't know when I will get to them, but I am hoping soon. I love this show, it came in the mail last Saturday and I have already watched it (listened to it) three times. Do yourself a favor and go get it. I got mine on Amazon.com for 14.97 brand new! Love it! I am a total sucker for Jane Austen and especially BBC versions, they are the best. Don't tell Clint but I bought this a few minutes ago, I have the videos, but I need the DVD's! So, if you are in the mood for some self-indulgence yourself, we still have our Moda pre-cut sale going on and things are moving fast so hop on over here! Nedra's quilt looks stunning...I've seen it on her design wall before it was finished, and it was gorgeous then...but amazing now! Glad my husband has never asked what fabric costs per yard! I always brag to everyone about your quiting, it is amazing. I am still smiling over that comment about 20 dollars...obviously he has not paid any attention when he goes to a quilt store with you...or maybe that is it, he has never gone with you....??? Do you know if you'll get Spring Fever jelly rolls back in stock? I saw this fabric at a quilt store in a jelly roll and when I went back they were sold out! I have a new baby to make a quilt for and I think this would be dang cute! I love those movies. the BBC P&P is the best movie ever, definately my favorite! Beatiful fabric and beautiful quilt! I am addicted to watching DVDs while I sew, and the BBC/PBS shows the absolute best. My big indulgence was full 2 season box set of The Dutchess of Duke Street. That will be my entertainment when I do the Friday Night Sew In tomorrow (check my blog for mor info on that). goodness, but doesn't BBC and Jane Austen make for some good tv watching? Remember when P&P was $60!?!?!? Love it! Your quilting compliments that purse quilt very well. What an unusual border - I'm not sure I've ever seen one like it! Nedra's quilt is gorgeous! 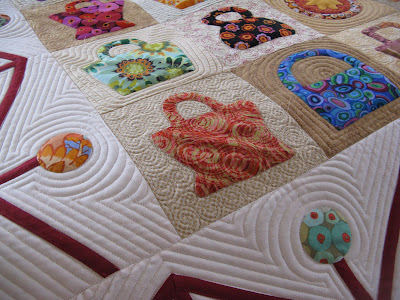 Love all the purses and the quilting around the circles is really cool. Nice fabric you bought yourself too...you'll have some good looking bags when you have a chance to use it! Love the quilt and the border is great. I love the way PBS does any Austen - it's just done right. Your quilting is so gorgeous. I'm sure Nedra will love it! Judi, I have to ask, even though Scrap Apple Quits is your competition--what is the name and maker of the top fabric in the photo--the black fabric with the pinks? 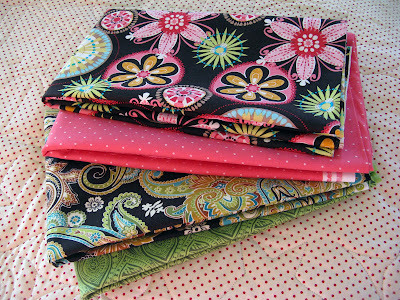 I LOVE brights on black and really must have this fabric! If you know the name and don't mind telling, please comment. I don't like leaving my email addy. 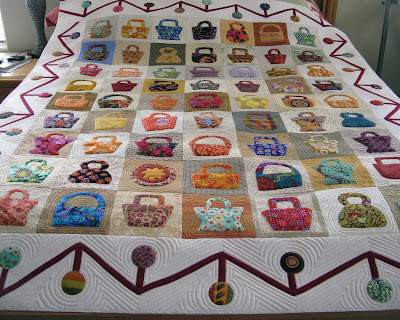 Love the purses, so adorable and your quilting is beautiful!! So we're not perfect and it's okay, but it looks perfect to me. I like watching Jane Austen also, those movies are wonderful. Okay, fabric on top that I bought is "Carnival Bloom" by Michael Miller! Hope that helps Carol A! Oh, and it's dark brown for the background, not black. I LOVE LOVE LOVE my quilt! Thank you so much for your beautiful work. And do I need to run over and leave my Elizabeth Gaskell DVD's for a few days? I love your quilting and I think going around the circles look great to me. I also like your choices of fabric - yes you can not get a lot for 20. Judi, How lucky is Nedra!!! Another outstanding artsy doing of yours. I love that you bought yourself some fabric, self indulgence is fun!!!!!!!!!!!!!!! Thank you for you!!! Thanks, Judi! Dark brown is good too, it's an 'in' color. Persuasion was great and it fyou enjoyed that you'll love the BBC adaptation of Elizabeth Gaskell's North and South. Very highly recommended and the male lead is very easy on the eyes. Persuasion is one of my favorites. Do you have the six hour copy of Pride and Prejudice it's wonderful too. I am a huge Jane Austen fan. I've read Pride and Prejudice at least 3 times, have both versions of the movie, plus Persuasion (both versions) and Emma. I love how Jane Austen's writing brings her characters to life. She's my favorite author.